Are you looking for a hostess gift? Maybe a little something extra to stuff in a stocking? Something for your kids’ teachers? How about a small gift to keep on hand for unexpected guests? 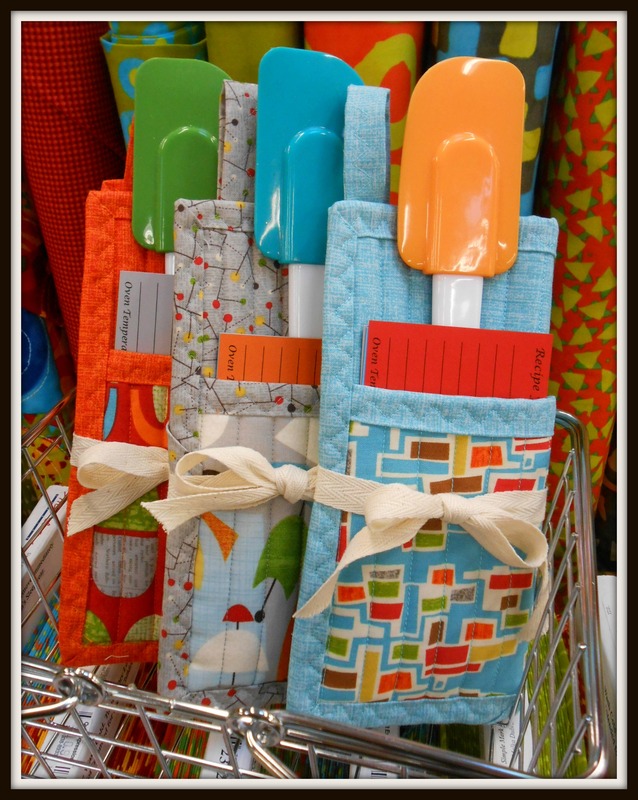 Della has the perfect gift…a folded pot holder with recipe cards and spatula. So cute! Finished size: 8″ square. 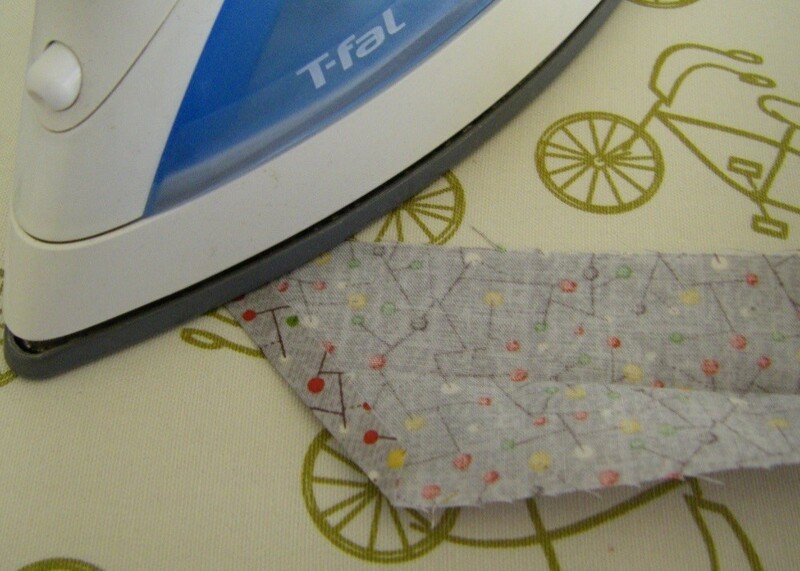 All seams are ¼”. 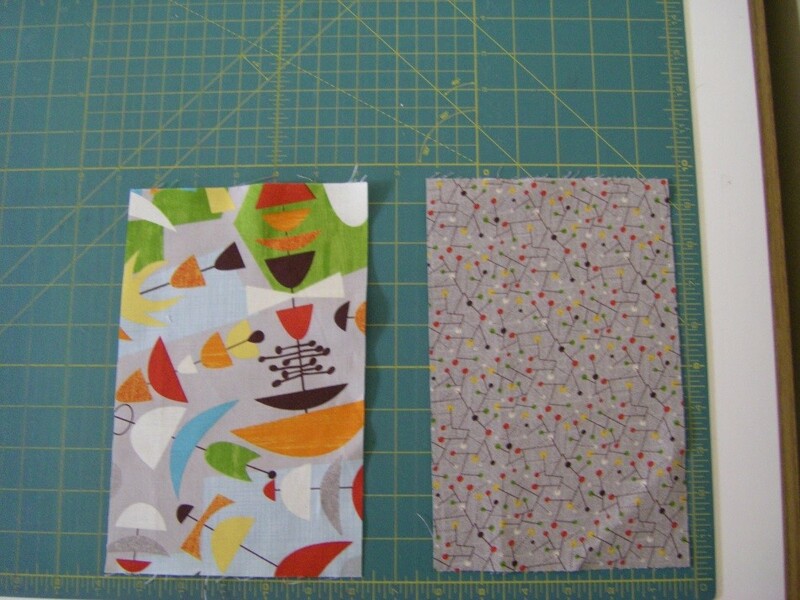 Cut (1) 9″ square from each fabric. 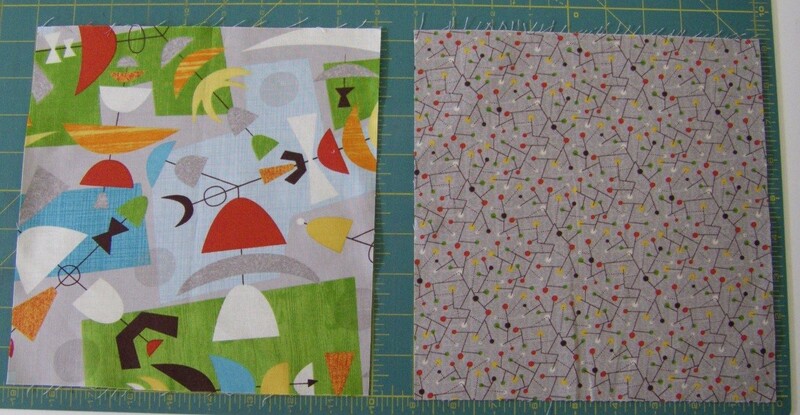 Cut (1) 6″ x 9″ rectangle from each fabric. Repeat with the 6″ x 9″ rectangles. 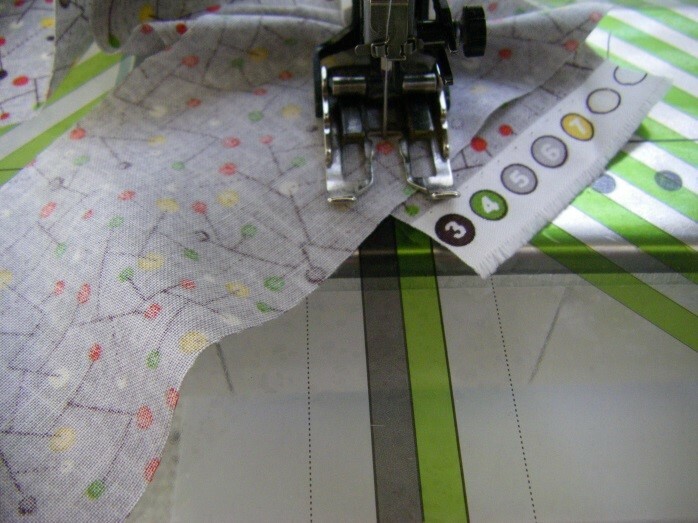 Mark a removable line (I use chalk) in the center to use as a guide for quilting. 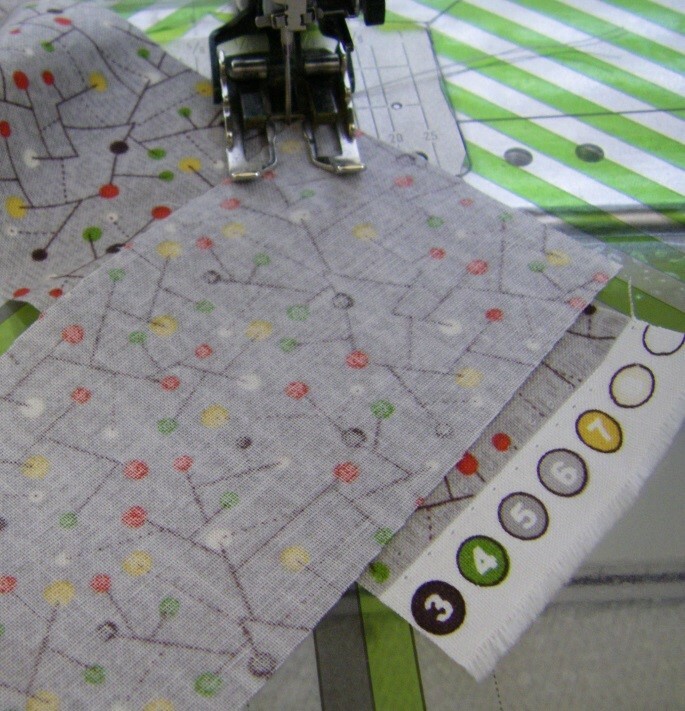 Continue quilting until the entire square is quilted. Repeat with the 6″ x 9″ rectangle. 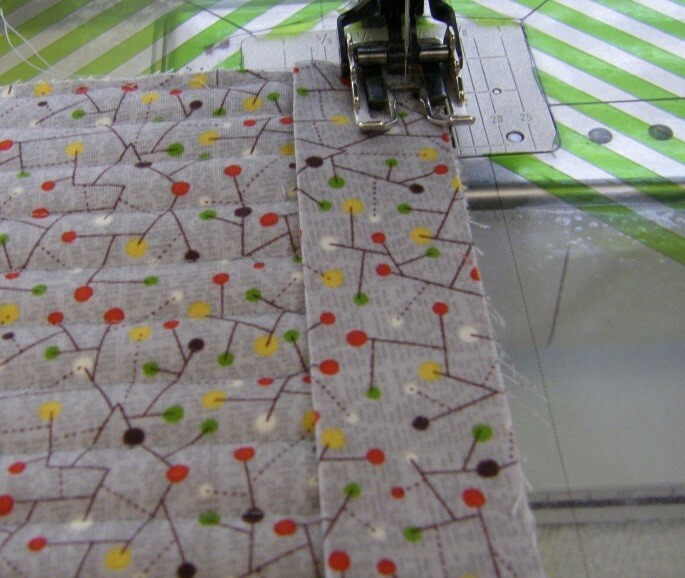 From one of the remaining fabrics, cut 2½” wide strips for binding. You will need about 52″ of binding. 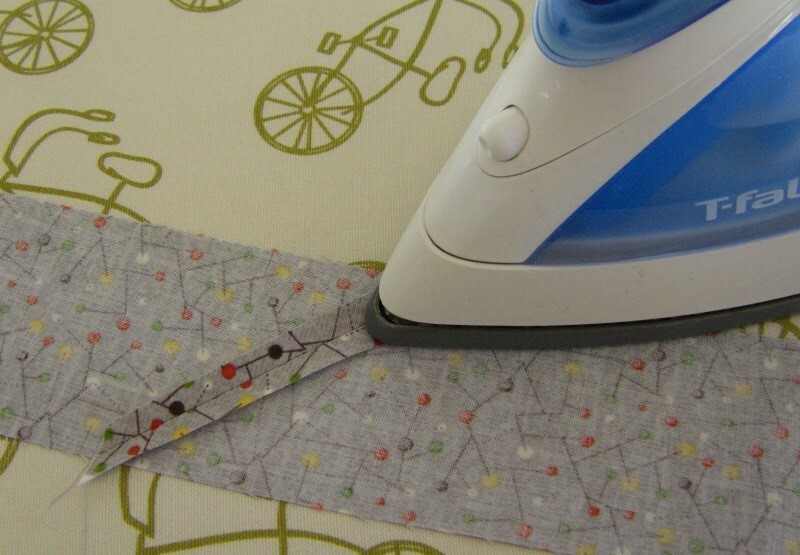 Place strips with right sides together overlapping at a 45° angle. Stitch from edge to edge. 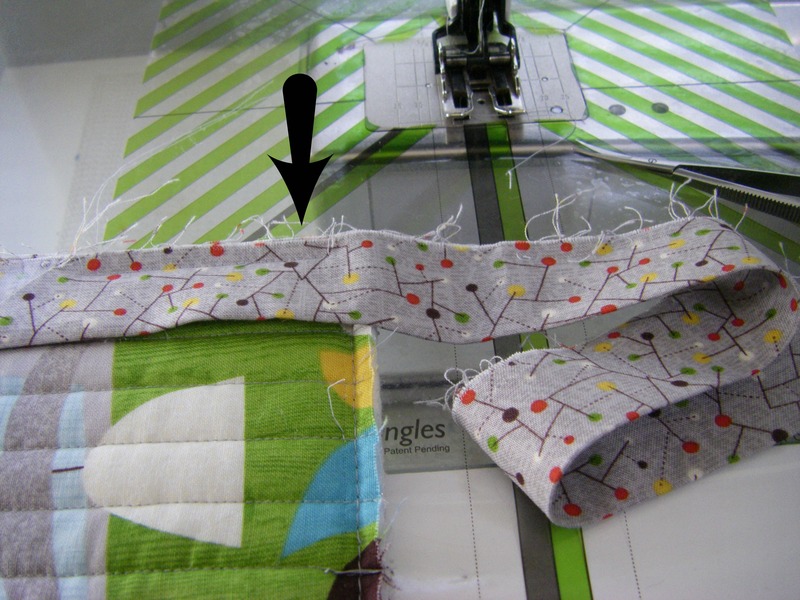 Trim excess fabric and press seam open. Press binding in half along the long side with wrong sides together . 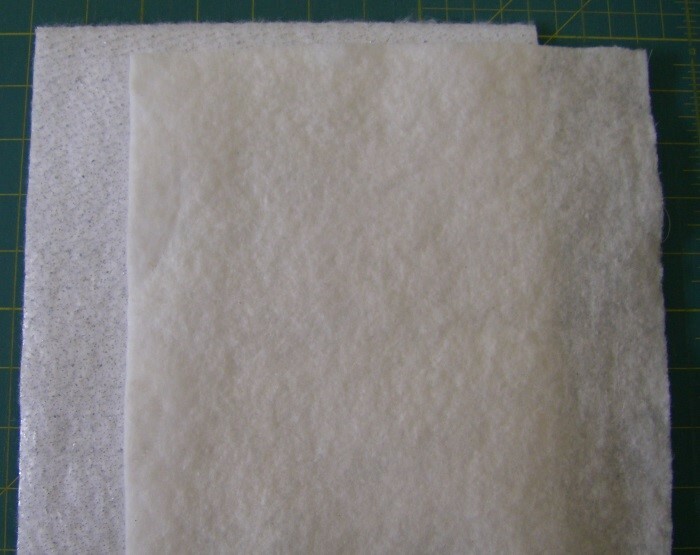 Fold binding over the raw edge and press. 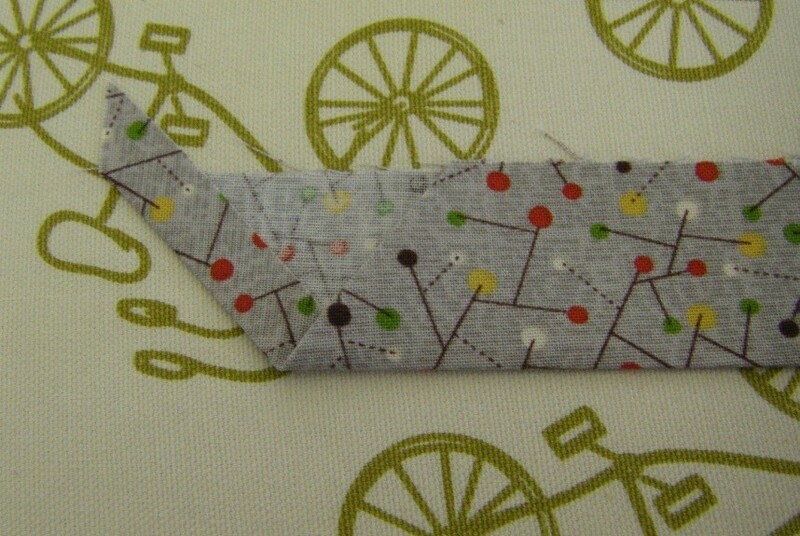 Top stitch 1/8″ from edge of binding. 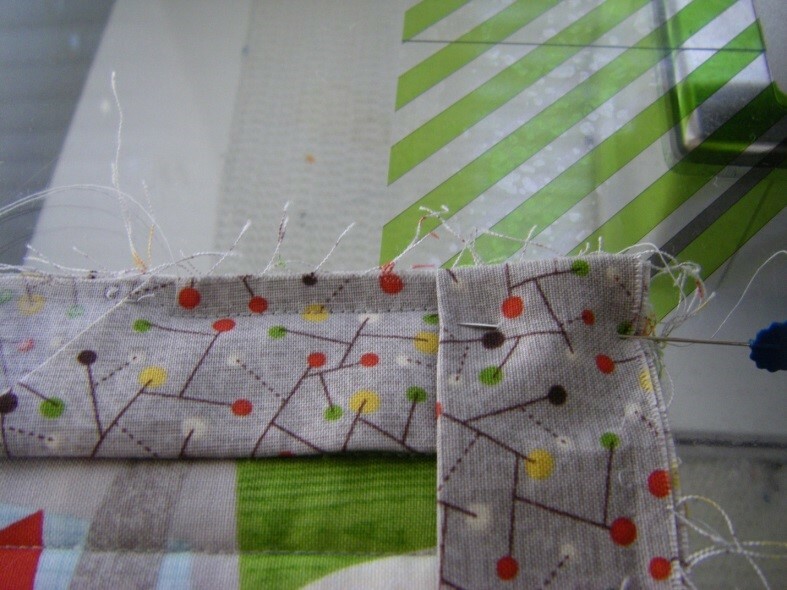 Cut off 6″ of the binding to make the loop. Unfold and press each long side to the center, then press in half again. Top stitch along each side or use a wide decorative stitch down the center. Set loop aside. Unfold remaining binding strip and cut a 45° angle from one end of strip. Press under ¼” along this cut edge. Re-press binding back in half with wrong sides together. Set aside. 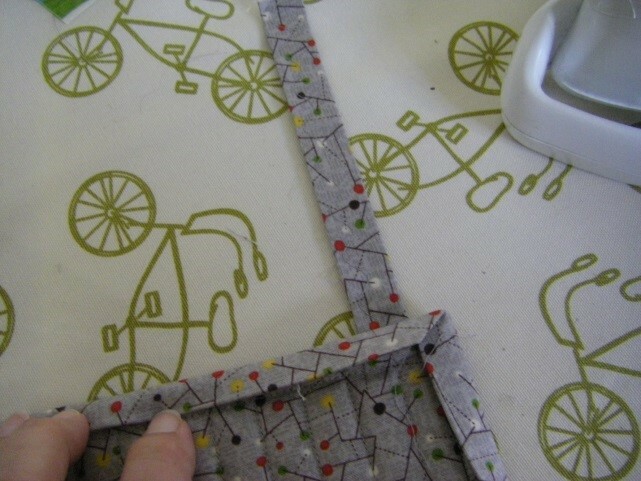 Baste the pocket to the potholder square along three sides leaving the bound pocket edge open. edges even. 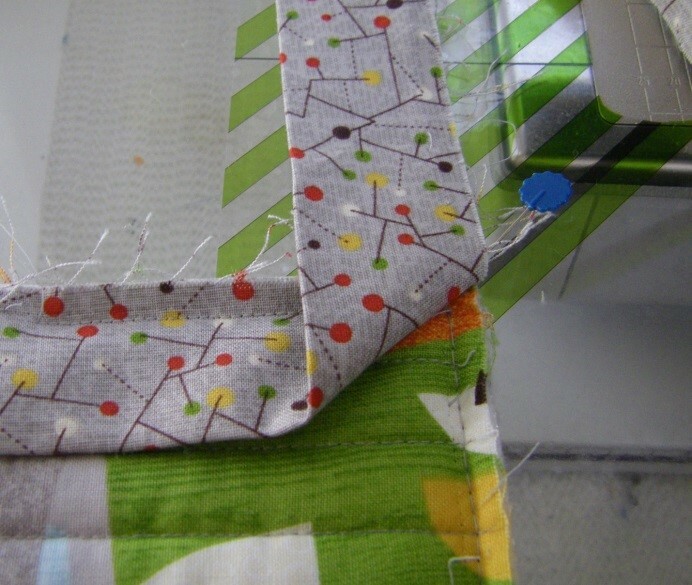 Start sewing on the binding just past the folded angle edge. Pin loop about ⅜” in from the long edge and with top raw edges even. 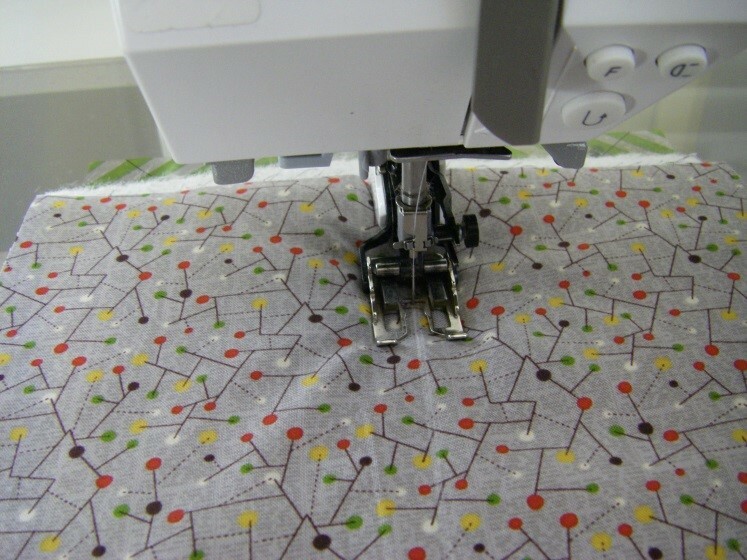 Stop stitching ¼” from edge and backstitch. 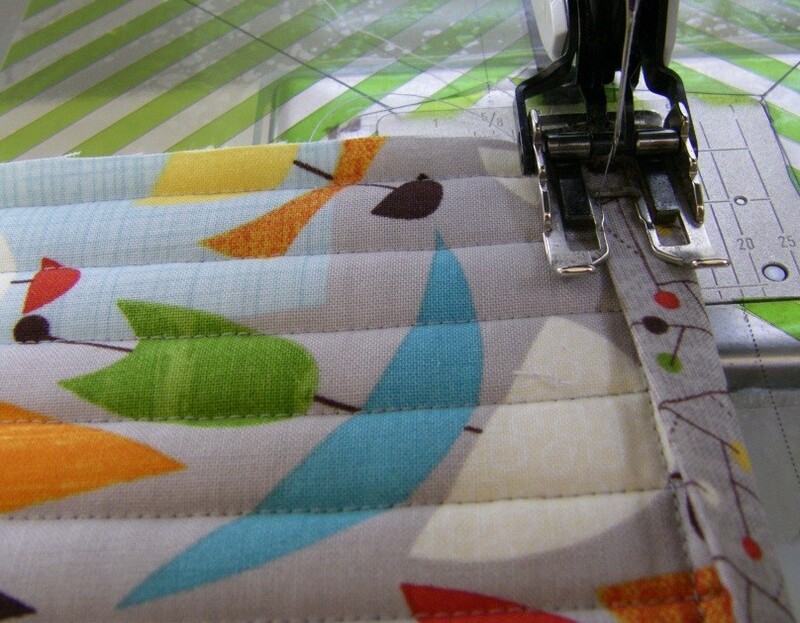 Remove potholder from under the presser foot and clip threads. 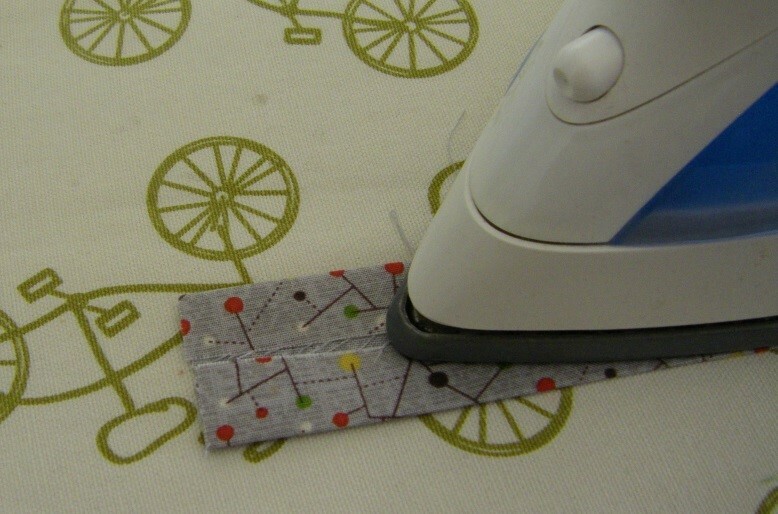 Pull binding straight up to make a 45° fold. 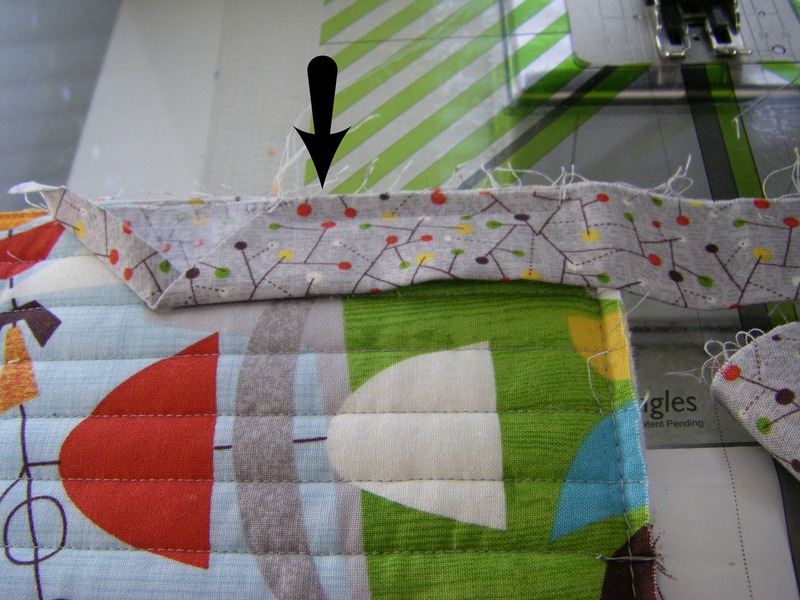 Fold binding back down over the 45° fold and align along the outside edge of the potholder. Pin in place. 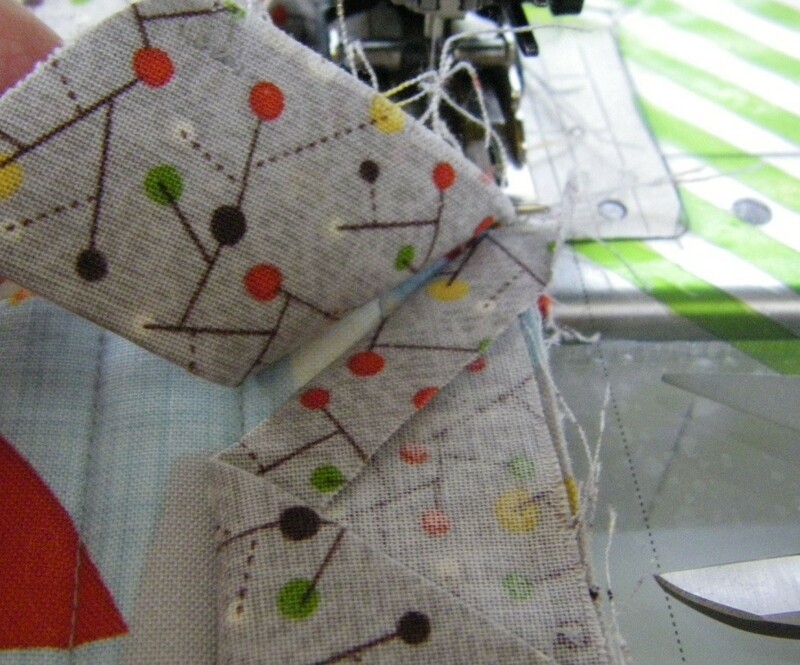 Start stitching from the top edge of the potholder and continue until all four corners are completed. 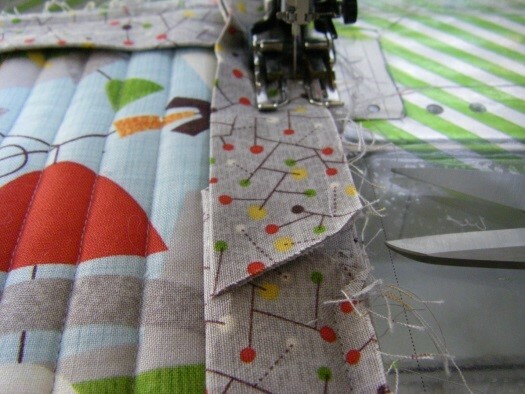 Be careful not to catch the loop when you are stitching the binding. 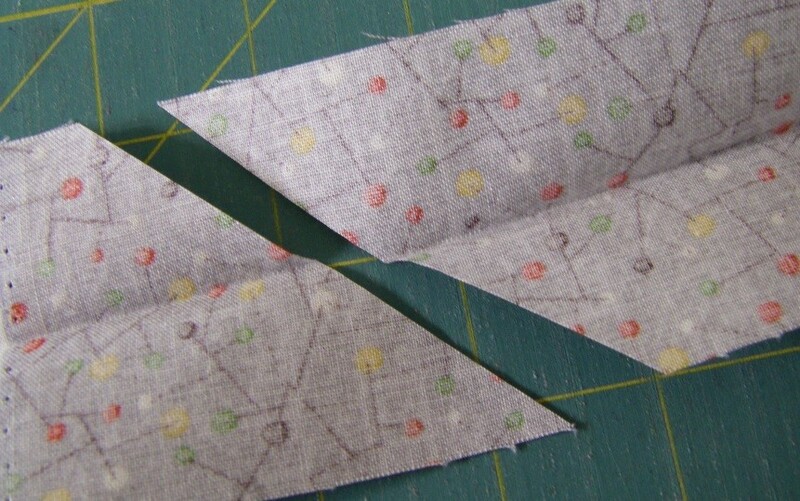 When you reach the folded angle, lay remaining binding on top and trim just past the angled fold. 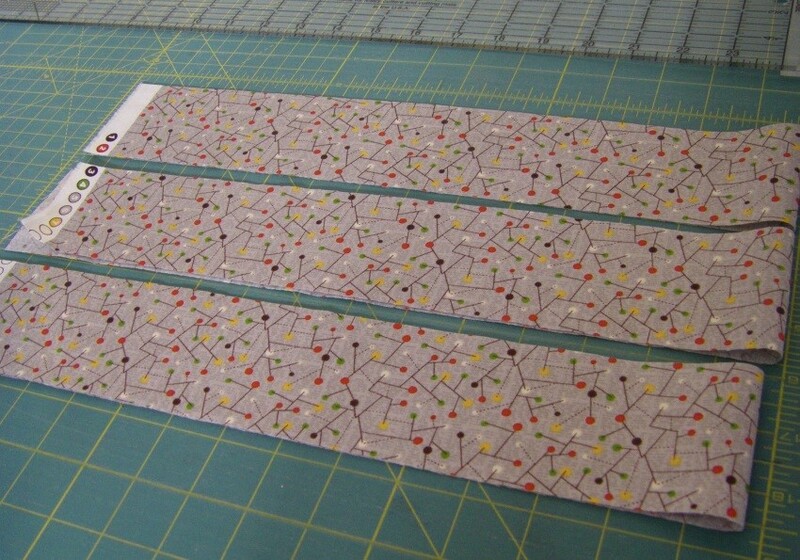 Make sure the bottom layer of binding is still lined up along the raw edge. 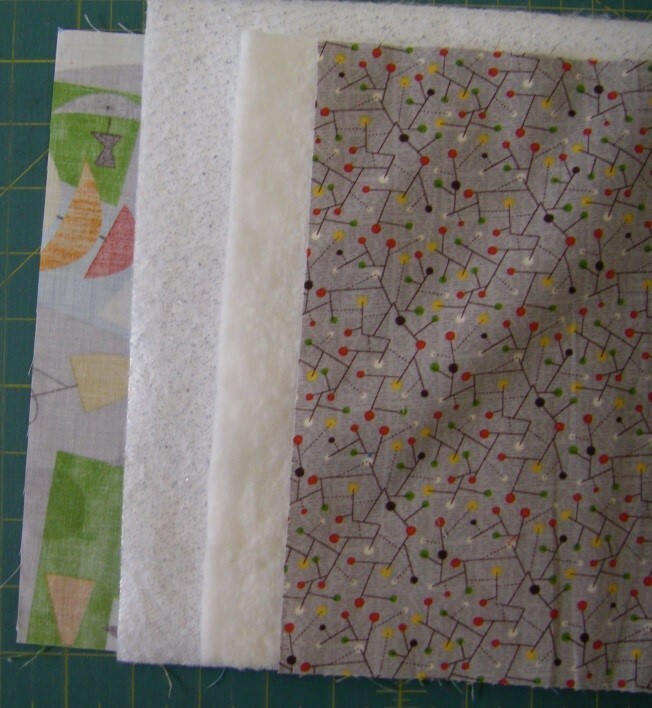 Fold binding over to the front of the potholder and miter the corners. Press. 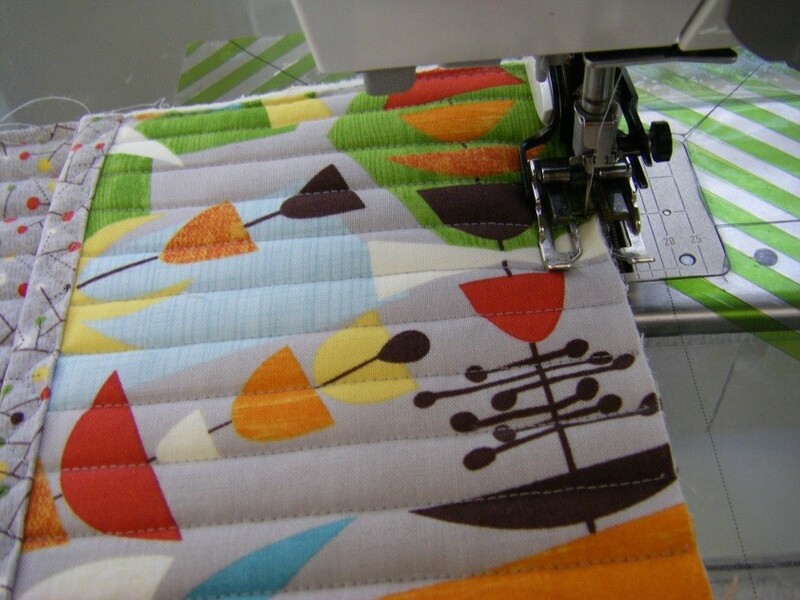 Stitch close to the edge of the binding with a decorative stitch or straight stitch. 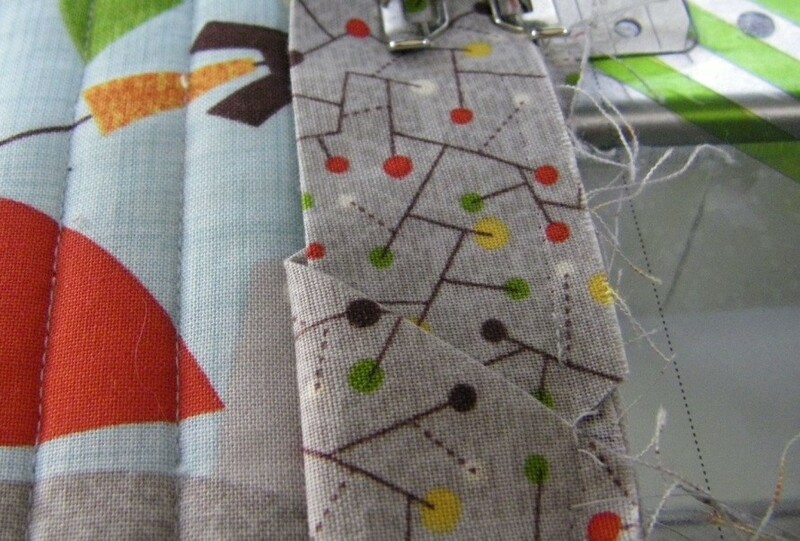 When you get to the loop, lift the loop up and then tuck the unsewn end under the binding. 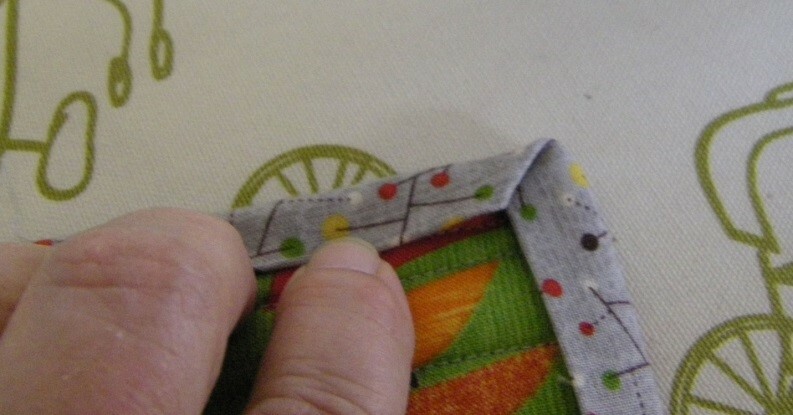 Pin in place and continue stitching the edge of the potholder. 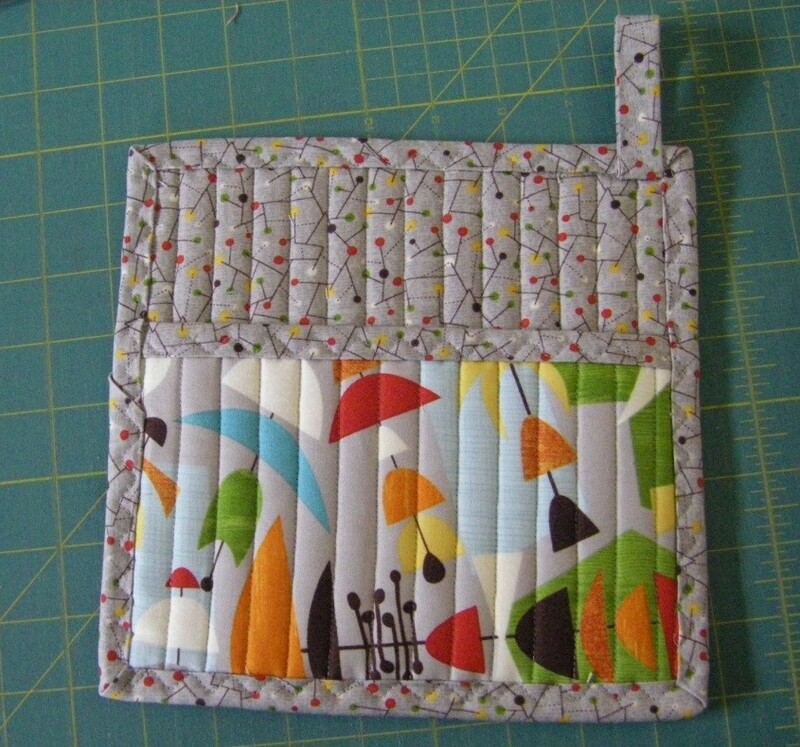 Your potholder is finished. Add some recipe cards and a spatula and you have a gift ready for giving. This entry was posted in 2013 30 Days of Gift Giving Inspiration, Tutorials. Bookmark the permalink. Really cute, might have to make a few of these! Cute project! 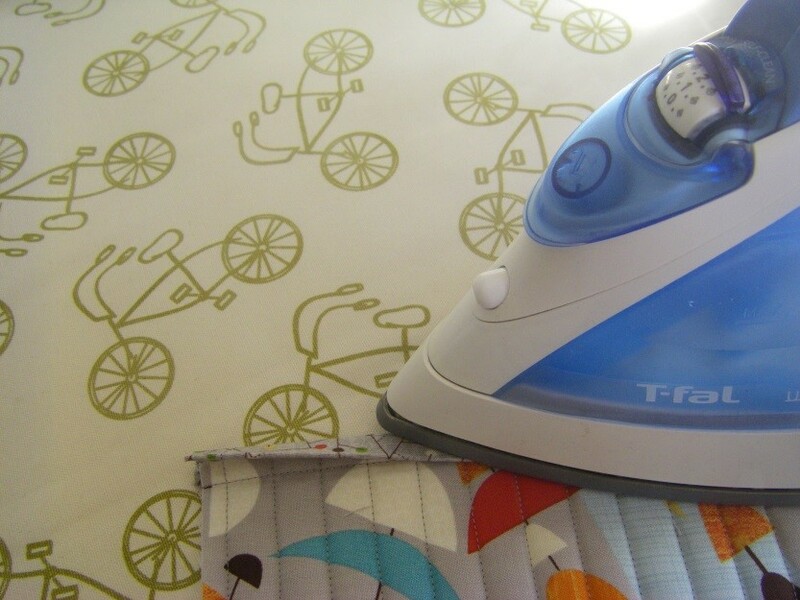 Your post makes me want a fun decorative cover for my ironing board! Very cute! I am going to have to make some of these for Christmas! I’ve always been intimidated by quilting but you made it seem easier than I originally imagined. Love your post. What a great idea. These will make great Christmas gifts. Thanks!!! These would be cute using holiday fabrics for different holidays throughout the year! Great wedding shower gift. 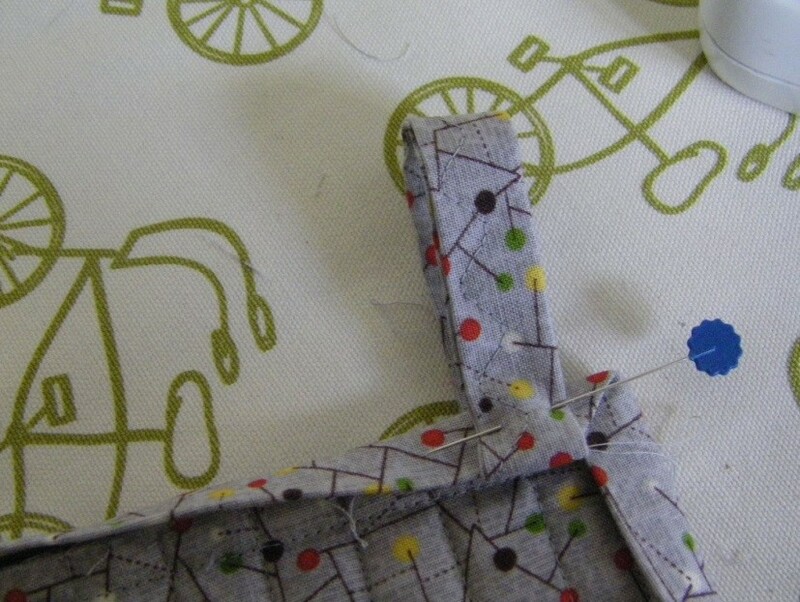 I am working on two of these using scraps I sewed together from a yellow and black apron. Thank you for making these lovely clear instructions. Thank you for the adorable idea! These are precious and I LOVE the detailed instructions and pics!! Thanks so much for sharing! Love it! Thank you for such a cute idea! I am going to make several! Thanks for a great idea. i have 15 of these made up with kitchen material fabrics. a good start on my Christmas giving, i also am adding a skillet handle hot pad to go along with the pocket hot pad. Reblogged this on Writing to the hearts of children. 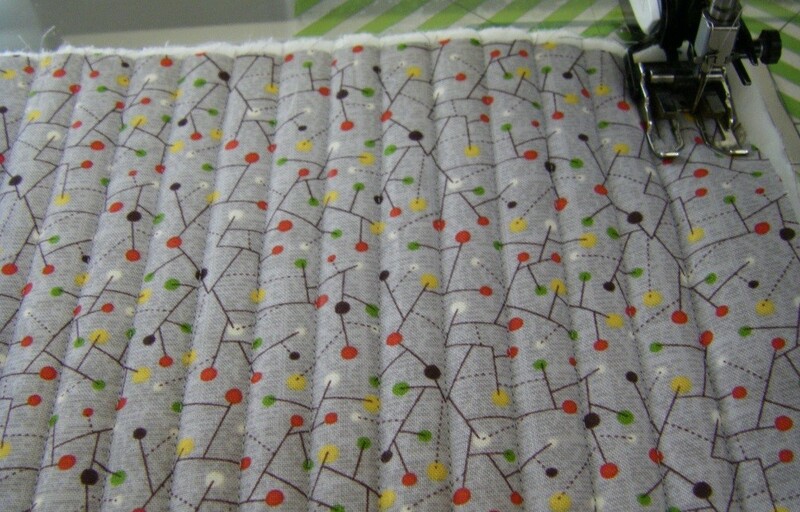 Potholder is awesome, lovely I will make some gift for my Bible group. Can you email this to my email? JUST featured this tutorial on my facebook page – A Slice of Texas! 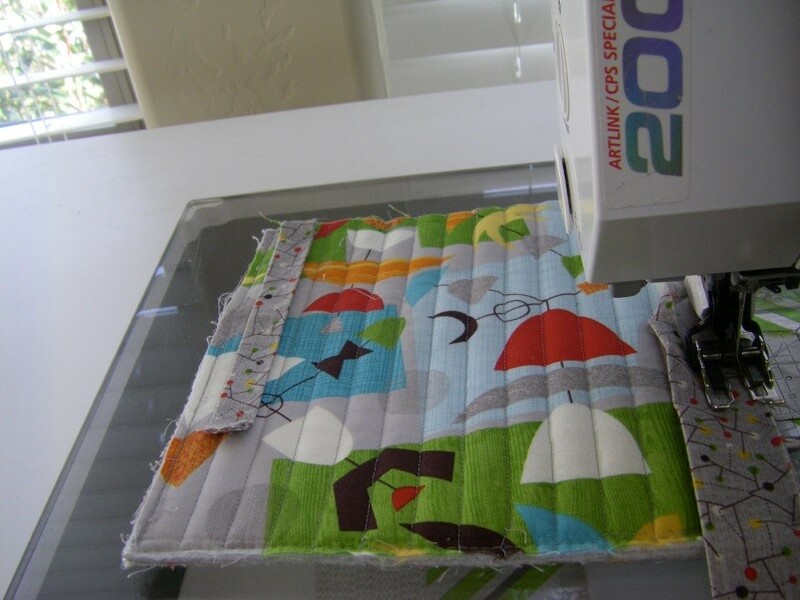 Helen, thanks so much for sharing our potholder tutorial on your Facebook page. We’re glad that you found it useful. Enjoy! What kind of batting is best? Can it be polyester fleece? We used Hobb’s 80/20 Heirloom batting, along with the Insul-Bright. I’m not sure enough about polyester fleece to “approve” it. Great tutorial for how to bind, I have not seen better. 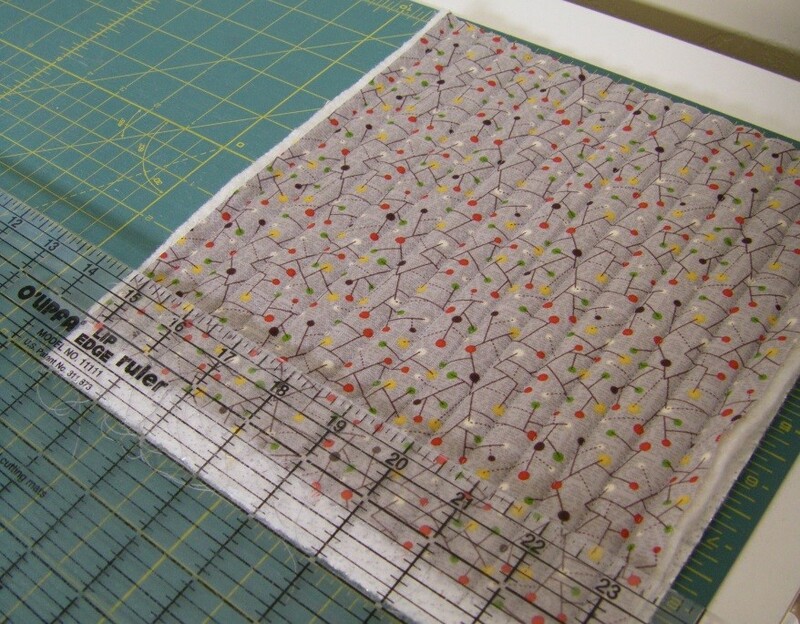 Would love to print your potholder pattern but I don’t want to print all the “responses”. How do I do it? If giving for a wedding shower–print a favorite recipe of yours for the new bride. I had a really hard time sewing through all of those thicknesses plus the insul- brute. I got one finished but won’t be trying more. It’s a really cute idea, what did I do wrong unless it was the batting I used in the middle? 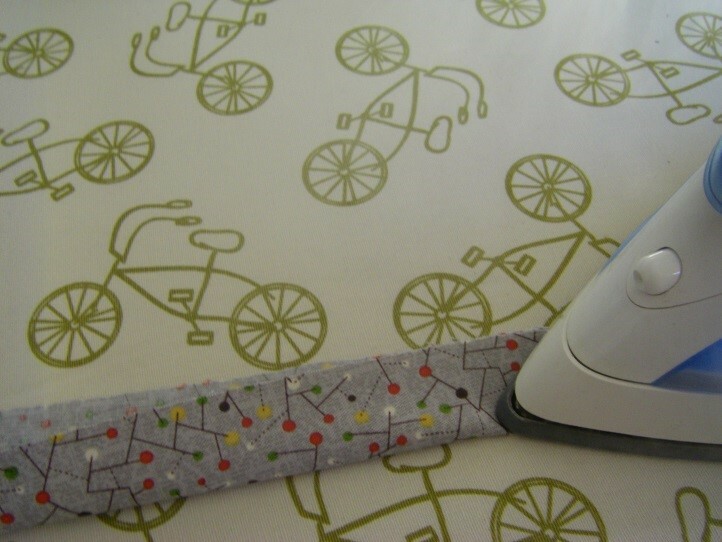 I used a cotton I had used in a quilt. Could that be what made it so hard to see through? absolutely LOVE your tutorial! I’m making up pairs of these with matching hanging towels to be paired with a grocery gift card and a jar of my apple butter for each of our adult children! Thank you so much for the awesome ideas! Very clever. Thanks for the great tutorial. I’ll have to make some for my gift box! Love these!!! Sure I’ll be making a few as gifts!!! What kind of batting did you use? I’m newbie and there are so many types of batting that I’m confused. Very cute!!!! I’m making these for sure!!! Really like these and will make some of these. Thank you for the post. would love to have a printable version! Awesome gifting idea. Thanks for sharing. I tried making this and just couldn’t miter the corners. So it looked pretty bad. Maybe I can find a video about that. I’m so disappointed in myself. Just found this and love it! Going to make some for door prizes for our family Christmas! Thsnk you!!! I love this pattern, I am recovering from hip replacement surgery and am finally able to get to my studio. I think these will make some quick sifts for my friends and my girls. May even enlarge it an do one for my adult boys who love to barbeque. Thanks for great instructions. This is well done. I am going to make a few. Was there an answer to the question about a printable version of instructions? I made 5 of these, and they came out so beautifully, for ladies who were guests at my table at our Christmas luncheon at my church. Thanks!